Going to MOA for Holiday Shopping? Don't Forget to Bring This! Going to the Mall of America for Holiday Shopping? Don’t Forget to Take This With! Without a doubt, I'll be going to to the Mall of America at some point this holiday season to shop for some gifts. Whether you're going to be at the Mall of America this weekend to get an early start or maybe you'll be more like me and you'll be at MOA frantically looking for gifts because you waited too long (yes, I did that last year) holiday shopping can get stressful, so let's have a little fun with it this year! Don't be so stressed while you're shopping this year. 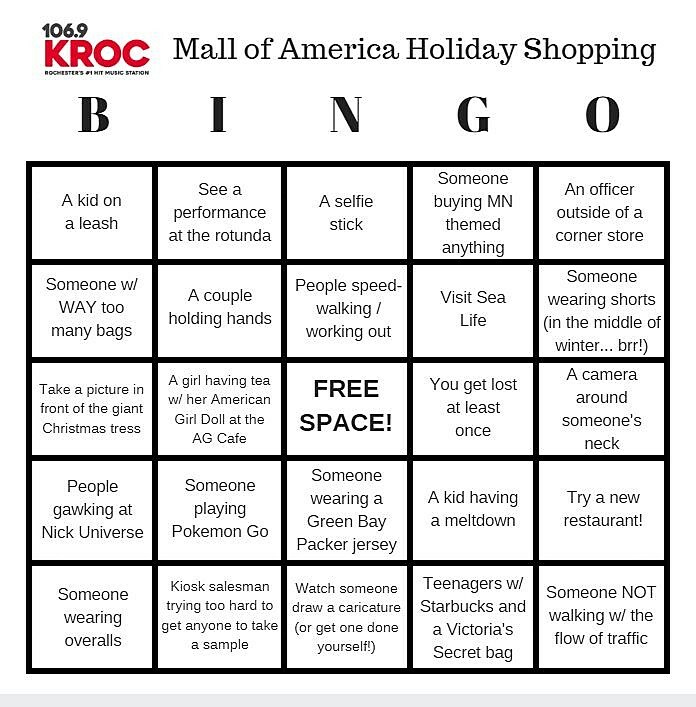 While you're out at MOA, use this BINGO card to spice up your shopping a bit! You can print out the BINGO card HERE! If you get a bingo, snap a picture and share it with us! You could be reading this on your phone! Download our free app today! Hang out with Carly Ross on 106.9 KROC every weekday 10-2pm!